Vegemite is a dark brown Australian food paste made from yeast extract. It is a spread for sandwiches, toast, crumpets and cracker biscuits, and filling for pastries. It is similar to British, New Zealand, and South African Marmite and to Swiss Cenovis. Vegemite was invented in 1922 by food technologist Dr. Cyril P. Callister when, following the disruption of British Marmite imports after World War I his employer, the Australian company Fred Walker & Co., gave him the task of developing a spread from the used yeast being dumped by breweries. Vegemite is made from used brewers' yeast extract, a by-product of beer manufacturing, and various vegetable and spice additives. It is salty, slightly bitter, and malty — similar to beef bouillon. The texture is smooth and sticky. It is not as intensely flavoured as British Marmite and it is less sweet than the New Zealand version of Marmite. 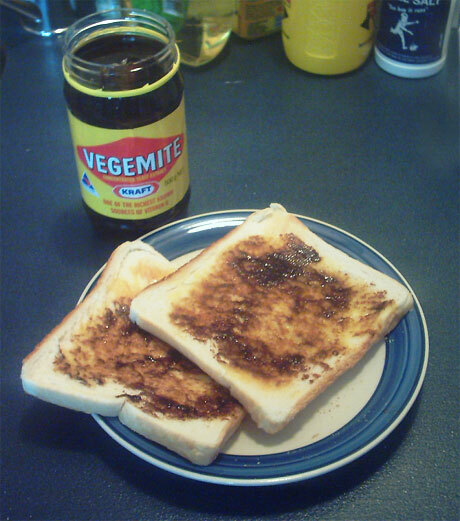 Vegemite has not been successfully marketed in other countries, apart from New Zealand and to a lesser extent in the United Kingdom, despite being owned by US food company Kraft Foods.